Pierre: “Friends, if y’all are looking for a great place to shop for everything pet related at terrific prices, with lightning fast delivery, and the friendliest folks around, check out Chewy.com. Speaking on behalf of Bentley and myself, we love our Zuke’s, FURminator and, of course, our friend Chewy! Disclaimer: Barking from the Bayou/mkclinton.com received a bag of Zuke’s Mini Treats and a dual FURminator brush from Chewy.com as part of their blogger program in exchange for an honest review. We only share information about products that we love and believe our readers will benefit from learning more about. There was no monetary compensation. Chewy.com is not responsible for the contents of this review. We are happy to co-host Thoughtless Thursday with Ruckus the Eskie and Love is being owned by a Husky. Join us for the fun because we have zero rules! Don’t think, just link! Hmmm, well da treats sound good! I don't mind brushin actually, it are dat handstrippin my momma does dat I hate. The treats sound really good and we do not like brushing...you would think we would as bichons!! Unfortunately, we could not participate in the Chewy Club this month...due to our traveling. We will be back on schedule next month!! YAY for Chewy and their treats!!! I had to haf my ears brushed last night....I DON'T like it! OMD, OMD, OMD! You got may favorite Zuke's minis! Isn't wabbit just the best. Go hide the brush, who needs such a thing really, but enjoy the wabbit. We always have a bag of them in our cupboard! Wow, we all love our chewy deliveries. They're the bestest company ever. Looks like a delish treat! Oh wow! I am loving that brush! 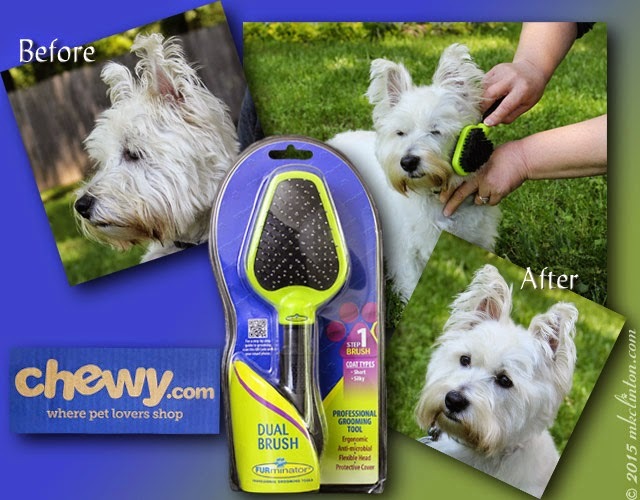 We have a DeShedding Furminator and it works like Magic when combined with THIS Dual Purpose Brush. The best pawt is that the EVIL SharkULA is now STARVING fur lack of FURS in his Canister. We love the Zukes Mini's too! Rabbit is a favorite! You sure do look spiffy, Pierre, that brush does a great job! We love the Zuke's mini naturals for training too, and the rabbit is a favorite flavor. That brush is pretty impressive! 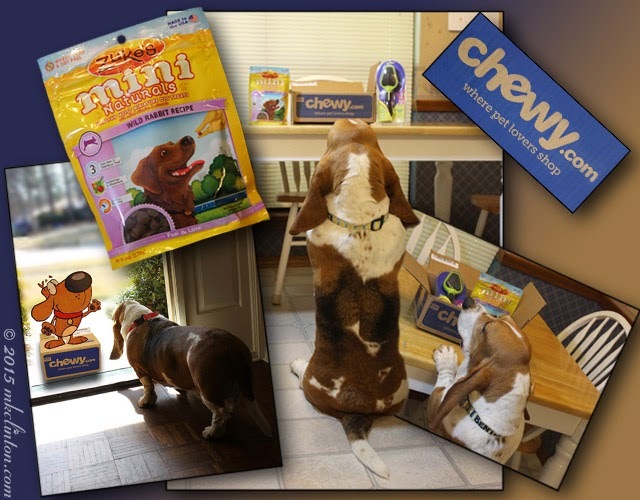 Hurray for Chewy! I have not yet used the dual sided brush. It looks pretty PAWsome. We've heard some good things about that brush...even for cats! We have a similar brush and love it too and don't get us started on those Zukes. We shop Chewy a LOT! wow pierre you clean up pretty nice, isn't that one great brush? We love ours.